Objective: This article aimed to describe the process of foundation and integration of patient safety module led by academic anaesthesiology department at King Abdulaziz's Faculty of Medicine. It also describes the main achievements and the most important challenges faced during implementation of this module during the last 5 academic years to guide other aspiring academic anaesthesiology departments in other medical schools for them to replicate the success. Methods and Subjects: Patient safety module was designed to be interprofessional and multidisciplinary module that depends on evidence-based approach to patient safety. It was offered during the 6th year medical study started in 2011–2012 as part of an integrated, hybrid, system-based curriculum at King Abdulaziz's Faculty of Medicine. The mode was delivered through interactive lecture (15% of the module contact hours), e-learning (15%), and practical sessions (70%). Student's assessment during the module included written exams and presentation of a patient safety advocacy project on group base. Results: The module committee continuously assessed the outcome measures of the module that included results of student's assessment, student's satisfaction, as well as student's self-reported learning of the module outcome. The module committee continuously revised the module in the light of these outcomes. Conclusion: Today medical school curricula aspire to graduate market-place ready safe and efficient future physicians. This requires implementation of effective programs that help students to recognize and show appropriate clinical and patient safety skills early and continuously in their professional education. Anesthesiology had made significant changes to today's healthcare worldwide compared to other medical specialities. Since the very beginning, anesthesiology has participated in systematic attempts to improve patient safety. Not only that, anesthesiologists are the current leaders in healthcare in the field of patient safety practices. As stated in Helsinki patient safety declaration in 2011, “Anaesthesiology is the key specialty in medicine to take up responsibility for achieving the goals which will notably improve Patient Safety in Europe.” Hence, anesthesiologists have a distinctive, cross-specialty opportunity to influence safety and quality of patient care. Decreasing “harm caused by health care” is a global priority, in response to which a marvelous increase in efforts for improving patient safety was observed during the past years with the development of “science of patient safety.” Patient safety was defined as “the avoidance, prevention and amelioration of adverse outcomes or injuries stemming from the process of healthcare rather than from the patient's underlying medical condition.” The clinical skills included diagnosis of illness, treatment of disease, after-care, and follow-up, representing the focus of most traditional medical curricula, while unfortunately, the skills essential to patient safety such as systems thinking, root cause analysis, application of human factor science and communication skills are not emphasized in such curricula. Medical curricula are faced with increasing number of must to add-on components. Human factors and patient safety principles showed increasing adaption, at various levels, at both undergraduate and postgraduate programs globally. 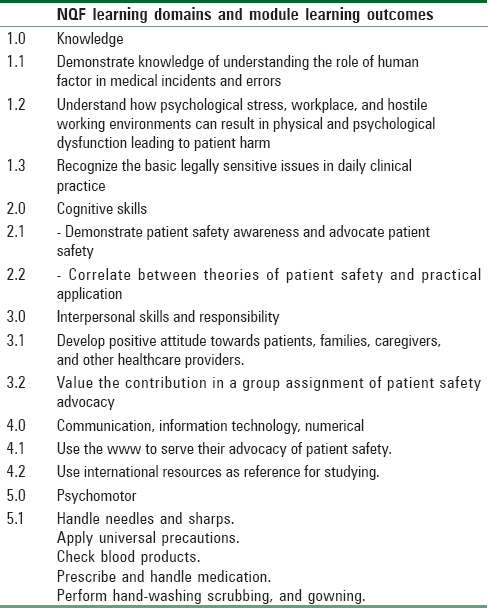 Although the World Health Organization (WHO) and the American Association of Medical Colleges (AAMC) has emphasized integrating teaching of patient safety and quality improvement in the medical curricula, only few medical schools have responded and included these topics in their curricula., Medical students need to recognize and show appropriate patient safety skills early and continuously in their professional education. Unfortunately, there is little evidence on best methods to teach the patient safety topic. When the patient safety curricula in different medical schools were reviewed, it was noticed that this topic was mostly taught during the third year of the medical study; the teaching duration ranged from 4 to 30 hours, and was frequently taught by clinicians, ethicists, and medical education experts. Unluckily, none of the current teaching met the objectives set by the WHO nor included structured assessments of a standardized curriculum. In response to all these changes, the Faculty of Medicine (FOM) at King Abdulaziz University (KAU) commissioned a project during the 2011–2012 academic year to integrate WHO-based patient safety model to undergraduate medical curriculum as part of the major curricular change implemented in the FOM during this period. This work aimed to describe the process of foundation and integration of patient safety module led by academic anesthesiology department at FOM, KAU. It also described the main achievements and most important challenges faced during implementation of this module during the last 5 academic years to guide other aspiring academic anesthesiology departments in other medical schools to replicate the success. Subjects of this study were 6th year medical students at the FOM, KAU who took the patient safety module during the last 5 academic years. The patient safety module was offered during the 6th year medical study. It was developed in the academic year 2011–2012 as part of an integrated, hybrid, system-based curriculum. In this year, FOM at KAU commissioned a project to integrate WHO-based patient safety model to the undergraduate medical curriculum as part of the major curricular change. It was designed to be an interprofessional and multidisciplinary module that depends on evidence-based approach to patient safety. The model was first added to internal medicine clerkship (2 credit hours out of 14 credit hours of the internal medicine clerkship). Later, 2016–2017, the module was approved as a separate independent mandatory module of two credit hours to be given in the final 6th year and still provided parallel to the internal medicine module over a 15-week semester. Self-initiated patient safety – projects. The module's learning outcomes were formulated by the module committee members through a series of meetings using the national qualification framework (NQF) Domains along with teaching and assessment methods are shown in [Table 1]. The mode of instruction of this module included interactive lecture (accounting for 15% of the module contact hours), e-learning (15%), and practical sessions (70%). The latter represented the majority of hours as patient safety module designed to be implemented as hands-on practical sessions to ensure that students could improve their attitudes and acquired the needed skills. Although the module was separately offered to both male and female students, standardization of teaching was ensured through standardizing the learning outcome (LOS), contents, hand-outs, as well as exams. Student's assessment during the module included written exams conducted at the end of the module through multiple choice questions (MCQs), which accounted for 40% of the marks. Twenty percent of the marks were assigned for implementation of “patient safety advocacy project” submitted and presented at the patient safety day the end of the module. The other 40% of the marks were assigned for the logbook and course work activities. Examples of patient safety projects submitted by the student during the last 5 years are shown in [Table 2]. The number of projects as well as the number of students who participated in patient safety projects from 2011 to 2017 are shown in [Table 3]. A continuous cycle of module evaluation was done by the module committee every time the module was implemented. A module evaluation survey was distributed to all students after finishing the module. Student self-reported learning of the module LOS was also distributed at this point. Another survey was distributed to them after taking the end of module final exam to assess the process of assessment. The opinion of the teaching faculty who participated in the module was also surveyed after module implementation. Small, face-to-face group meetings were conducted by the head of the module with each working group of students during preparation of their project to obtain feedback on their work and provide any support requested by them. Project supervisors who advice the students during the preparation of the safety projects were of varied background disciplines. They were also asked to share their opinion during module evaluation. The module was annually revised by the module committee in light of the results of all the abovementioned surveys, and an improvement plan was prepared based on student's feedback. A report annually prepared by the module committee included the results of student's assessment (marks), the results of students and faculty evaluation of the module, as well as an improvement plan. This report was issued to the Quality and Academic Accreditation Unit (QAAU) in the FOM and discussed in the main curriculum committee. Results of student's assessment (marks) were one of the module outcome measures that were verified using the item analysis results, including the difficulty and discrimination indices as well as checking the exam blueprint against the exam question. External verification of students marks assigned to the patient safety advocacy projects was done through an external judgment panel to help in assessing students' projects. Student's satisfaction with the module assessed using three five-point Likert surveys distributed to the students was another set of module outcome measures. These surveys were independently analyzed by the QAAU, and the results were formally issued to the module committee. The mean of student's satisfaction was calculated and presented separately for male and female as well as total students. Examples of the results of module and exam evaluation by students during 2016–2017 are shown in [Table 4] and [Supplementary Table 1] [Additional file 1]. Self-reported learning of the module in the academic year 2016–2017 is shown in [Figure 1]. It was found that students were overall moderately satisfied with the patient safety module during 2016–2017. The highest satisfaction was recorded in usefulness of the module for student's career, use of clinical cases during teaching, reasonable number of tests given during the module, and appropriateness of the duration of the exams. Finally, the clinical skill and simulation center were found to be well-equipped for the clinical study. It was noticed that the overall self-reported learning of the students was high (mean satisfaction = 4.23). The highest mean satisfaction was reported in two psychomotor skills including perform hand-washing scrubbing, and gowning and handle needles and sharps, with mean satisfaction of 4.54 and 4.51, respectively. It is important to mention that many challenges were faced by the module committee at various steps of module construction, development, and implementation. Examples of the challenges during the two academic years as well as the actions taken by the module committee to overcome these challenges are presented in [Table 5]. The report of the Institute of Medicine (IOM) issued in 1999 regarding building a safer health system warned policymakers and other healthcare stakeholders about the major problems regarding patient safety, which represents a global concern in the provision of quality health care. It was reported that more people die in a given year because of medical errors than from motor vehicle accidents, breast cancer, or AIDS. Major medical education reforms at the medical school and residency training program levels are necessary for fundamental improvements in patient safety, as recommended by patient safety experts. Among the issues that were raised by students during their evaluation of the modules during the year 2012–2013 was the “revision of the mode of teaching of certain topics.” In response to this concern, some module lectures were turned into practical sessions to make it relevant to their outcomes. A self-directed learning time of patient tracking was also assigned with collaboration of different university hospital clinical areas, where each student was assigned to shadow a patient for few hours and reflect on patient's experience in regards to safety of practice in one of the logbook sections based on plus/delta format. Teigland et al. quoted a comment of one student expressed his opinion regarding patient safety and quality improvement module who said “Any situation that causes us to act, rather than simply read from papers or listen to lectures is going to be helpful. I learn by doing.” This comment was very supportive to the changes made in the module. Teigland et al. reported that, based on their students' survey, students are in favor of a new curriculum that formally addresses patient safety and quality improvement. They perceived the lectures and independent study methods as very unpopular methods for learning these topics. On the other hand, discussions of real life mistakes or participation in projects on real patients were considered as most helpful for learning about patient safety and quality improvement. It was noted that the use of a combination of didactic and interactive lectures, specific psychomotor skills training during practical sessions, as well as self-directed safety projects in this module attracted students' attention and ensured great enthusiasm and engagement in learning for developed program. Some previous studies revealed that involving medical students in patient safety and quality improvement projects could not only have a promising effect on student learning but could also advance the quality of care for patients.,, Therefore, incorporating these projects into medical school curricula might be “an effective use of resources on multiple levels.” The findings of a study conducted in a medical school at UK included in its curriculum a 5-hour module on patient safety introduced through lectures, videos, and role playing were supportive to our findings. They recorded an improvement in knowledge and perceived control over safety with no effect on student's attitudes. Using a well-resourced reference and experienced faculty had a significant impact for the perception of learners about the curricular nature of the patient safety principles. In response to students' request, diverse faculty members from different specialties and backgrounds was recruited to participate in module teaching. A lawyer with medicolegal experience and safety officers were among the teaching staff in this module. Leung et al. stated that healthcare administrators with experience in patient safety might be helpful in patient safety education as was experienced in a Chinese medical school. The contributions of the faculty from the school of nursing was reported by Myung et al. to be an effective step toward interdisciplinary training in patient safety module. Finally, the continuous and ongoing curricular review and modifications resulted in continuous improvement of the module overtime, with more students, faculty, and administrative involvement and commitment. It is worth mentioning that students, faculty, and teaching hospital gained many academic and professional rewards during this journey. A clear commitment, determination, and support of the Dean of the FOM and Curriculum Committee members, along with collaboration with clinical skills and simulation center as well as the university hospital administration were key essential requirements for such as developments and results. Further follow-up studies are needed to reflect on long-term impact of the patient safety module on students' learning and performance. In conclusion, today medical school curricula aspire to graduate market-place ready safe and efficient future physicians. This requires implementation of effective programs that help students to recognize and show appropriate clinical and patient safety skills early and continuously in their professional education. The process of patient safety module foundation and integration at FOM, KAU has been an interesting journey with many lessons learned. The author would like to acknowledge the Dean of FOM-KAU; professor Mahmod Alahwal, Faculty s' leadership, all committee members and the Quality and Academic Accreditation Unit (QAAU) for their ongoing support. I would like also to acknowledge Professor Abdulaziz Boker, for his help in reviewing this article as well as all working team in the clinical Skills and Simulation centre (CSSC), at the FOM-KAU. Gaba DM. Anaesthesiology as a model for patient safety in healthcare. BMJ 2000;320:785-8. Schleppers A, Prien T, Van Aken H. Helsinki Declaration on patient safety in anaesthesiology: Putting words into practice - experience in Germany. Best Pract Res Clin Anaesthesiol 2011;25:291-304. Jorm C. Patient safety and quality: Can anaesthetists play a greater role? Anesthesia 2003;58:833-4. Holmes JH, Balas EA, Boren SA. A guide for developing patient safety curricula for undergraduate medical education. J Am Med Inform Assoc 2002;9 (6 Suppl 1):S124-7. Vincent C. Patient safety. 2nd ed. Oxford: BMJ Books; 2010. Thompson DA, Cowan J, Holzmueller C, Wu AW, Bass E, Pronovost P. Planning and implementing a systems-based patient safety curriculum in medical education. Am J Med Qual 2008;23:271-8. Foundation National Patient, Institute LL: Unmet needs: Teaching physicians to provide safe patient care. National Patient Safety Foundation; 2010. Available from: https://www.npsf.org/. [Last accessed on 2018 Aug 04]. Walton M, Woodward H, Van Staalduinen S, Lemer C, Greaves F, Noble D, et al. The WHO patient safety curriculum guide for medical schools. Qual Saf Health Care 2010;19:542-6. Myung SJ, Shin JS, Kim JH, Roh H, Kim Y, Kim J, et al. The patient safety curriculum for undergraduate medical students as a first step toward improving patient safety. J Surg Educ 2012;69:659-64. Windish DM, Reed DA, Boonyasai RT, Chakraborti C, Bass EB. Methodological rigor of quality improvement curricula for physician trainees: A systematic review and recommendations for change. Acad Med 2009;84:1677-92. Nie Y, Li L, Duan Y, Chen P, Barraclough BH, Zhang M, et al. Patient safety education for undergraduate medical students: A systematic review. BMC Med Educ 2011;11:33.
WHO. Patient Safety Curriculum Guide for Medical Schools. 2009. Available from: http://www.who.int/patientsafety/education/curriculum/en/index.html. [Last accessed on 2018 Aug 01]. Kohn LT, Corrigan JM, Donaldson MS, Editors. To Err Is Human: Building a Safer Health System. Washington, DC: National Academies Press; 1999. Mayer D, Klamen DL, Gunderson A, Barach P, Telluride interdisciplinary roundtable. Designing a patient safety undergraduate medical curriculum: The telluride interdisciplinary roundtable experience. Teach Learn Med 2009;21:52-8. Teigland CL, Blasiak RC, Wilson LA, Hines RE, Meyerhoff KL, Viera AJ. Patient safety and quality improvement education: A cross-sectional study of medical students' preferences and attitudes. BMC Med Educ 2013;13:16. Thain S, Ang SB, Ti LK. Medical students' preferred style of learning patient safety. BMJ Qual Saf 2011;20:201. Gould BE, Grey MR, Huntington CG, Gruman C, Rosen JH, Storey E, et al. Improving patient care outcomes by teaching quality improvement to medical students in community-based practices. Acad Med 2002;77:10-11. Ogrinc G, Nierenberg DW, Batalden PB. Building experiential learning about quality improvement into a medical school curriculum: The dartmouth experience. Health Aff (Millwood) 2011;30:716-22. Patey R, Flin R, Cuthbertson BH, MacDonald L, Mearns K, Cleland J, et al. Patient safety: Helping medical students understand error in healthcare. Qual Saf Health Care 2007;16:256-9. Leung GK, Patil NG, Ip MS. Introducing patient safety to undergraduate medical students–a pilot program delivered by health care administrators. Med Teach 2010;32:e547-51.